Mix the mozzarella, cream cheese, jalapeños and salt. Shape into walnut-sized balls. Empty the flour into a shallow dish. Beat the eggs in a deep dish, place 50 g of breadcrumbs in a deep dish. In batches, toss the jalapeños in the flour before dipping them in the egg and then in the breadcrumbs, press firmly on the crumb coating. Transfer the remainder of the breadcrumbs to a clean dish. Dip the jalapeños in the egg and then in the breadcrumbs once again, press firmly on the crumb coating. Fill a pot to ⅓ with oil and heat it to approx. 180°C. 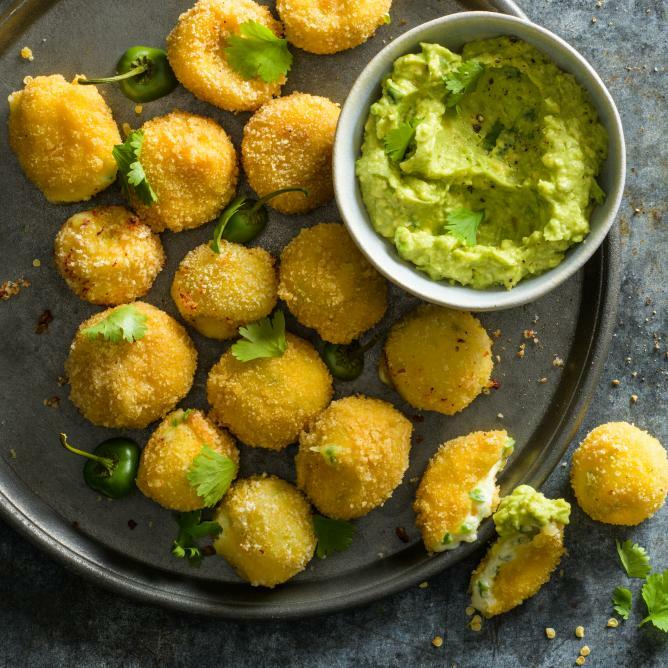 Deep fry the jalapeño bites in batches for approx. 4 mins. each, remove with a slotted spoon, drain on kitchen paper.